While addressing a largely attended public meeting at Mela Ground Dehgran in Churah Assembly Constituency in Chamba district today, Chief Minister Shri Jai Ram Thakur said that Churah was the 40th constituency he has visited during the five month tenure as Chief Minister of the State. He said that Churah area of Chamba district would be developed from tourism point of view under new schemes such as ‘Aaj Purani Rahon Sae’ and Naye Rahae-Nai Manjilae’.He said that the present tenure of the Government has ensured balanced and all-round development of the State. He said that the district has played a major role in formation of the Government in the State.Shri Jai Ram Thakur said that credit of development goes to visionary leaders like Shri Shanta Kumar, who build a sound foundation for the further development of the State. He said that present State Government was giving thrust on development of those areas which remained ignored due to one reason or other. He said that the sole objective of the Government was to work with active cooperation of the people of the State.The Chief Minister said that said that the Budget for this year presented by him in the Vidhan Sabha shows the commitment and resolve of the State Government for making Himachal Pradesh one of the most prosperous states of the country. He said that today the nation was headed by a visionary leader Shri Narendra Modi and under his leadership the country was poised to become a most powerful and developed country of the world. 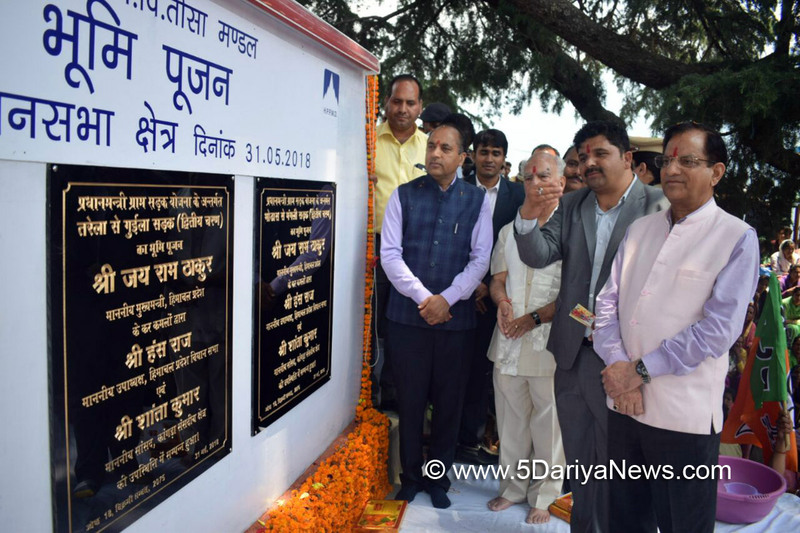 He urged the people to strengthen the hands for Shri Narendra Modi in the 2019 elections.Shri Jai Ram Thakur said that the previous State Government opened several health and educational institutions without any budget provisions.Earlier, the Chief Minister laid foundation stone of Bus Stand Bhanjraru to be constructed at a cost of Rs 1.80 crore. He said that the Bus Stand would comprise of four bus ways with interlocking tiles flooring with the facility of one booking office, one Adda In-charge room, waiting lounge and toilet block. In addition, it would also have a shopping complex, he added.He also laid foundation stone of Tissa to Bhuin Road (Stage I/II) at bus Stand Banjraru to be constructed at a cost of Rs. 1.64 crore. and inaugurated 40 meter Span Shukrali Bridge at Shukrali Nallah constructed at a cost of Rs 2.40 crore, He also laid foundation stone of link road to village Junas (Stage-I) to be constructed at a cost of Rs 1.97 crore, of Trella Gulla Road (Stage -II) to be constructed at a cost of Rs 2.84 crore and of Trella to Bhuras Road (Stage-I/II) to be constructed at a cost of Rs 4.15 crore.He also announced that an ITI would be opened at Tissa and 50 bedded hospital Tissa would be upgraded into 100 bedded hospital. He also announced that a IPH division would be opened at Tissa in near future. He also announced opening of Primary schools at Bugga and Khagal and upgradation of Middle School Junas to High school. He also announuced bus service from Bharagarh to Shimla.Chief Minister also released a calendar on the occasion.Member of Parliament Shri Shanta Kumar said that Shri Jai RamThakur represents younger generation of the BJP leadership in the State. He said that the five month tenure of the BJP in the State under the leadership of Shri Jai Ram Thakur has witnessed unparallel development. He said that Chamba district, being the border district of the State, and the last five years of the previous Government completely ignored the district in matter of development. He said that the Union Government headed by Prime Minister Shri Narendra Modi was resolved for the development of backward areas of the country. He said that the State Government got loan burden worth crores from the previous Government due to their financial mismanagement and un-mindful expenditure. He said that he was endeavouring to start a cement plant in Chamba district. He said that this would not only wipe out unemployment from the district, but also usher in a new era of prosperity in the district.He announced Rs. 5 lakh from MP Fund for development of Dehgran ground.Deputy Speaker Vidhan Sabha and local MLA Shri Hans Raj while welcoming the Chief Minister to his home constituency said that Churah was one of the backward constituencies of the State which has immense tourism potential, but it was ignored during the previous tenure. He detailed various developmental demands of the area.Panchayat Samiti Tissa Vice Chairman Shri Bodh Raj welcomed the Chief Minister and other dignitaries present on the occasion.H.P. Vidhan Sabha Speaker Dr. Rajiv Bindal, Food and Civil Supplies Minister Shri Kishan Kapoor, MLA Nachan Shri Vinod Kumar, Organization Secretary Shri Pawan Rana, Chairman Wafk Board Shri Rajbali, former MLA Smt. Renu Chadda, BJP leader DS Thakur, Deputy Commissioner and SP Chamba were present on the occasion among others.